The strong support being given to the $3.4 billion Columbia River Crossing highway expansion project by Oregon Governor John Kitzhaber represents a u-turn from his previous positions. The two-time governor was once considered a progressive thinker when it came to transportation. Comments made during his first term as Governor now seem at odds with his strong support for HB 2800, the “CRC bill” that passed a vote in the Oregon House this morning. On February 13th, during the first of two hearings on HB 2800, Kitzhaber sounded like a staffer for the CRC project. He rattled off all the talking points one by one and painted a picture for lawmakers of dire urgency if the project fails to move forward immediately. In 2013, Kitzhaber clearly believes that dumping billions into a massive highway expansion that will harm neighborhoods, promote sprawl, and put Oregon’s finances at risk is the best way to manage our transportation system. No matter what else he works on, his legacy will be defined by many Oregonians as a leader who pushed us into a 1950s-style, more-lanes-will-solve-everything highway building project. 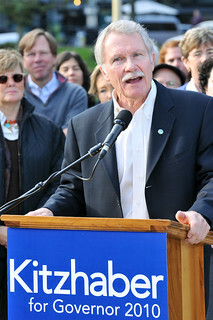 But at one time in his life, Kitzhaber had a much different outlook. In his State of the State address in 1997, two years into his first term, Kitzhaber spoke at length about transportation. Managing our roads was one of his three top priorities (along with education and natural resources). Doing things differently was his major transportation theme. He was trying, admirably, to change course on the huge ship that is the Oregon Department of Transportation (ODOT). He wanted them to think outside the box when it came to managing traffic demand and transportation behaviors. Key to this change, Kitzhaber said, was the false notion that we can buy — or build — our way out of congestion. “Money alone won’t buy quality of life and will not buy our way out of congestion in the long run. With this speech Kitzhaber was laying the groundwork for his proposal to reform transportation funding. Kitzhaber was launching a push to raise funds through a gas tax increase, a general transportation fee, and a vehicle miles tax. He saw those measures as essential not just for financial reasons, but in order to “manage growth more effectively.” In other words, Kitzhaber wanted to decrease the amount of driving by Oregon citizens. A week after his speech Kitzhaber told The Oregonian that he wanted a “market approach” to dealing with traffic congestion in Oregon. Apparently the debate has changed. 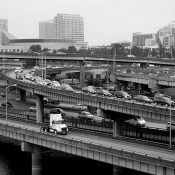 Kitzhaber and the Democrats in the state legislature have put all their effort into backing the CRC project; a project that will promote sprawl, encourage single-occupancy vehicle use and drain state coffers for many years while hurting the public health and vitality of the communities it goes through. What accounts for Kitzhaber’s change of tune? Has he been sold a lie by CRC staff, lobbyists, and consultants? Or does he really believe the CRC is a good project? I tend to think that the political and lobbying power behind this project is so strong that not even the Governor of Oregon is able to stand up against it. What do you think? Oregon Democrats are owned by the trade unions that do their election cycle ground game for them, and in many cases provide the slim 2-3% margin of victory with the hundreds of thousands of points of outreach contact they can deliver. Glad to hear you say that Hart. 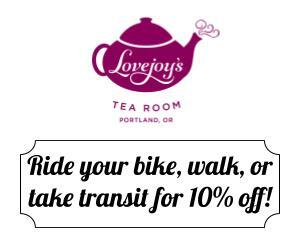 Usually BikePortland does nothing but bash Repubs for being crooked. You speak as if having a strong organizing force on your side is somehow evil. Unions are (small d) democratic institutions. They don’t have the money that corporations can throw around, but they have legions of voters. Why wouldn’t a political party be influenced by a large block of voters? Aren’t politicians supposed to represent the voters? Still true sixteen years later. Unless the old way was what Kitzhaber was singing about in ’97. How do you get from defeating the Mt. Hood freeway to trying to reform ODOT away from what it, apparently, still is, to cheerleading the CRC? This is disgusting. Why are our leaders so consistently disappointing? Jules Bailey? Kitzhaber? Hales? Come on, folks. Show some backbone! Hurray for Lew Frederick! Um, ever heard of Occupy? Citizens United? McCain-Finegold? Seems that lots of people recognize that money runs politics in this country. 1. It is not designed simply to ease congestion for suburban commuters. This isn’t a Washington County ring road or an extra lane on I-205. It will greatly benefit through traffic, on one of the world’s most important roads for commercial travel, in addition to ‘helping’ commuters. 2. It will replace a massive, expensive piece of infrastructure that needs to be replaced ASAP. It may not be falling apart now, but it certainly won’t be in better shape 25 years from now if we have to take another run at it. There are lots of good reasons to oppose the CRC. It simply being a highway expansion is not one of them. People aren’t questioning the need (a small number are, admittedly), but rather the size and impact of the rebuild and the priorities that are being represented on the project as a whole. By building bigger, that leaves less money for other projects that are in need. How does it benefit through traffic? I don’t see that happening at all. The tolling is going to increase congestion on the I-205 bypass which will slow down through traffic. On the I-5 the changes are only expected to shave a couple minutes off the commute time for Clark County residents and will do nothing to change what is actually the bottleneck for through traffic most of the time which is the rose quarter area. This freeway expansion does not provide the benefits for through traffic or freight that some folks think it does. The Common Sense Alternative clearly addresses those two issues better than the current plan, all without destroying the businesses that need a higher span in order to move their products downriver. The I5 bridges are structurally sound and do not “need to be replaced ASAP.” There are many bridges in Oregon in far worse condition. Upgrading the bridge’s supports for mordern earthquake standards could be done at a fraction of the CRC’s cost. If you call the existing I-5 crossings “massive and expensive”, then what the heck does that make the CRC project? Have you even looked at the engineering drawings? Just the proposed interchange on Hayden island contains more steel and concrete than the entire existing crossing! Open your eyes! $3.6 billion to help an ailing $50 million mall = waste of money! you really think more pavement will solve the same problem that it didn’t solve before? Sorry, it’s got 55 years of life left in it. There are hundreds of structurally deficient bridges in the NW, the CRC not among them. As for traffic, check out maps of the travel models, post-construction, or read the Independent Review Panel’s report. I don’t think we want to encourage or benefit through travel on I-5, necessarily. As for this being ‘one of the world’s most important roads,’ well, that is a bunch of hyperbole. I’m with Hart Noecker on this one. It would have been far easier, cheaper and more effective to convert one though lane in each direction into a high occupancy toll (“HOT”) lane with variable tolls that maintain speeds of, say 30 mph at the chokepoint. Busses and trucks would go in this lane, as would people willing to pay. If this sort of “low concrete” approach had been seriously considered rather than dismissed out of hand, I might believe in this project. Unfortunately, every reasonable alternative to this massive boondoggle has been quickly “analyzed” and then ignored by the CRC’s boosters. I think the trade unions (not to mention most of the big engineering firms) are all at the trough, pushing this as hard as they can. And it’s shameful. This project has been driven for over a decade by federal funding. “Trade unions” are a small part of that. Its the developers, businesses and highway contractors that have the biggest clout. They expect several billion dollars in federal money to raise the tide for everyone. In the 1990’s Oregon delegation had the seniority to deliver big projects on their own. By 2000 that was no longer the case. This project was explicitly made a regional priority because it would have Washington DOT and its congressional delegation on board to deliver the funding. Its about federal pork, not transportation choices. Trade unions are most definitely not just a small part of it. I can tell you from experience. That is actually not true. Improvements on I-205 would improve through traffic. I-5 serves local traffic, including traffic going in and out of the ports in Vancouver and Portland. Great article Jonathan. I’ve been asking myself the same questions. The organization, power and influence of business and labor groups backing the project is clearly at play. But that can’t explain it all and it certainly should not make us defeatist. The direct environmental and public health impacts of the CRC on neighborhoods and the region are not as evident (but no less real in the long-run) as they were in the case of the Mt. Hood Freeway and the Westside Bypass. That- and the branding of CRC as a bridge project instead of the massive freeway expansion it is- has worked in proponents favor. However I’d wager that- at this point in history- the fiscal and environmental consequences of the CRC are far more severe than earlier freeway expansion proposals in this region. Proponents have been successful so far- not because they are that powerful- but because they have been able to hide, deny, or obscure those impacts behind an innocuous sounding “bridge” project. But that strategy can’t work forever… and there remain lots of things that could knock it off course. It is why opponents need to get and remain organized. We have to continue to make our voices heard, even after today’s vote. It is greatly upsetting to me that Kitzhaber, Kotek, and the other Democrats have chosen to make this their project. I strongly suspect that will not bode well for their political futures, but that may be just as well. That past tense reference seems a bit harsh. A lot of progressives are opposed to this project and I respect their position. However, I think a lot of us are simply agnostic. I have a hard time generating much enthusiasm for the project or rage against it. I must have missed the memo indicating that this is the fight of our generation? Does the interstate bridge need to be replaced? Yes. is the CRC more expansive and expensive than necessary? Probably. 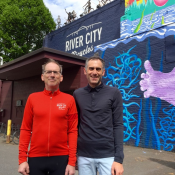 Is the CRC a threat to urban Portland akin to the Mt Hood Freeway or Westside Bypass? Absolutely not. In my mind it is possible to be a strong urbanist and progressive while also supporting (or at least being agnostic towards) the CRC. Let’s move on. I do not think that being a strong urbanist, and supporting a massive freeway expansion through the center of an urban area is compatible. Most of our money will go to Washington to help them widen 7 miles worth of freeway and interchanges. Good deal for Washington, huh? Replaced or repaired? I am not convinced the bridge is worth tossing. I wonder how much it would cost to bring all the bridges in the area up to code rather than expand all that freeway. We could probably do that and build two more bridges for the cost of this freeway expansion that happens to include a bridge. Care to elaborate? I suspect those who live in its path might disagree with you. Besides, didn’t we learn a thing or two from the defeat of the Mt. Hood Freeway? That alone makes this worse, even if it somehow didn’t hit all the same notes, which it does for me. We need a massive chorus of voices calling on the Senate for a new direction and a stop to HB 2800. Kitzhaber is hoping his legacy is making healthcare work through prevention. And given that, his trumpeting of a project that dumps more pollution into neighborhoods that are said to have the highest rates of asthma in the state is even more puzzling. If he dislikes the project, at least don’t be a cheerleader for it. Do like Hales and let it live or die on its own. Finally, WA commuters will be more interested in light rail over the river when N.PDX starts restricting parking near the Yellow Line corridor. My neighborhood is currently a park’n’ride, which will not last long. I agree, I think Kotek is just a political novice in this. She was put up as Speaker by pro-CRC interests just to get this through, and when it ultimately fails, they’ll have no more use for her. Which is unfortunate, because having gone to the town hall at Classic Foods and thought she was pretty on point otherwise. Come to find out she’d met with a group of her constituents about the CRC before the meeting and is continuing to ignore our pleas. Can we start calling this the BRIDGE TO NOWHERE? Well, if Vancouver and the richer economy of Washington is ‘Nowhere’ you might have a point. But you don’t. This is a proven vital piece of our transportation network. How can it be both ‘vital’ and yet so inadequate as to need to be scrapped, and it’s replacement, like an engorged tick, dropped onto our town? I don’t disagree that have *A* bridge over the Columbia is vital. But a massive freeway expansion that does nothing to address the bottleneck that happens at the Rose Quarter does not fix the supposed congestion problem that proponents are supposedly so worried about. Update the one that’s there, which can be done for 1/20th of the price. Instead, this project just dumps BILLIONS of dollars into a car-centric project when we should be thinking of innovative ways to reduce SOV travel rather than encourage it with 16-22 lanes of highway bliss. This is indeed a bridge to nowhere – nowhere being a future where people don’t need 22 lanes, and where we will be wondering how we pay the $30 million in debt service for years to come. All the while we’ll be struggling to retrofit the infrastructure we already have with empty pockets because our highway funds get shoveled to banks in the form of interest. What future do you want to live in? Kitzhaber seems so gung-ho about it now I feel he just sees dollar signs in fed funding. Which will create a ton of construction project jobs and make it looks as if our state’s economy is booming through digging ourselves into a hole. This is the worst environmental vote in decades and the Democrats were all for it. Where’s the OLCV? Joe Cortright has a fine analysis of the House CRC bill on Portland Transport. Sad that OR Dems are about to let this horse out of the barn. That Metro the rep at the Governors’ I-5 TF voted against the “6-2-2” for the DEIS; had Andy C. voted yes, it would have carried by 10 to 9, and ODOT would have been under more pressure in the DEIS to look at more cost effective alternatives. That the Environmental Justice rep on the I-5 TF and other dissenters ended up voting YES; a 25-3 vote would have been much stronger than the 27-1 with me the lone dissenter. That Metro’s rep to the CRC group, Burkholder, (elected as an environmentalist!) failed to challenge the assumptions behind the mega-project that staff/consultant were pushing. Indeed the project under his watch grew to 12 lanes from the 10 proposed by the I-5 TF. Mayor Adams was more effective, getting it back to 10. 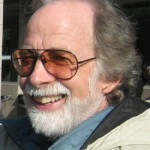 That Tom Hughes won the Metro President election by just a few votes over Bob Stacey. Burkholder made no effort on Stacey’s behalf. So is some one out there prepared to take this thing to court? I think he is selling out because he wants to run for President eventually. Americans vote for pseudo cowboys. And he has always put so much faith in Patricia McCaig, unfortunately. This list of ostensibly “green” consultants working on (and representatives supporting) the CRC is, I’m sure, pretty long. And I’m pretty sure they wouldn’t appreciate being called out.